The International March of the Living has expressed deep concern over a recent CNN special that cited ADL statistics entitled State of Hate, claiming an "increase in anti-Semitism" in recent years. March of the Living Chairman Shmuel Rosenman commented: “In recent years, Europe and the USA are both awash with a strong wave of anti-Semitism; this new poll further supports this notion. "We mustn’t bury our heads in the sand, we should all take accountability and teach the lessons learned following the Holocaust. Europe must wake up and take serious steps to eradicate this phenomenon, as so many of its inhabitants hold dangerous and anti-Semitic narratives. This is why in the last several years March of the Living has increased the number of non-Jewish teenager participants from all across Europe. "An entity composed of European Prime Ministers and Presidents must be established, so they could fight anti-Semitism, as well implement an organized and thorough Holocaust Studies educational program to prevent such ignorance - which leads to hate,” Rosenman said. 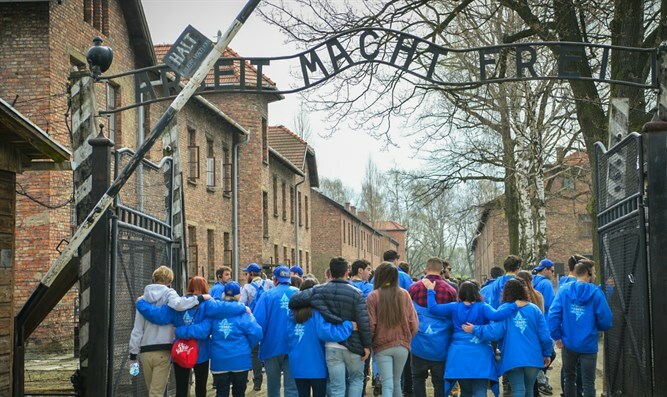 On May 2, 2019, Holocaust Remembrance Day, over 10,000 students will participate in the annual March of the Living, as they march with Holocaust survivors from Auschwitz to Birkenau. They will be joined by thousands of other people of diverse backgrounds and faiths as they march in memory of all victims of Nazi genocide. “Our mission of education is as important today as it ever was, if not more so, given the reality of the internet and the ability to spread hate and hatred across the globe in real time," said President Phyllis Greenberg Heideman. "Education is our weapon against ignorance and an insurance policy for a better future for all humanity,” she said.